Hey look! Some of my originals have their skirts still! 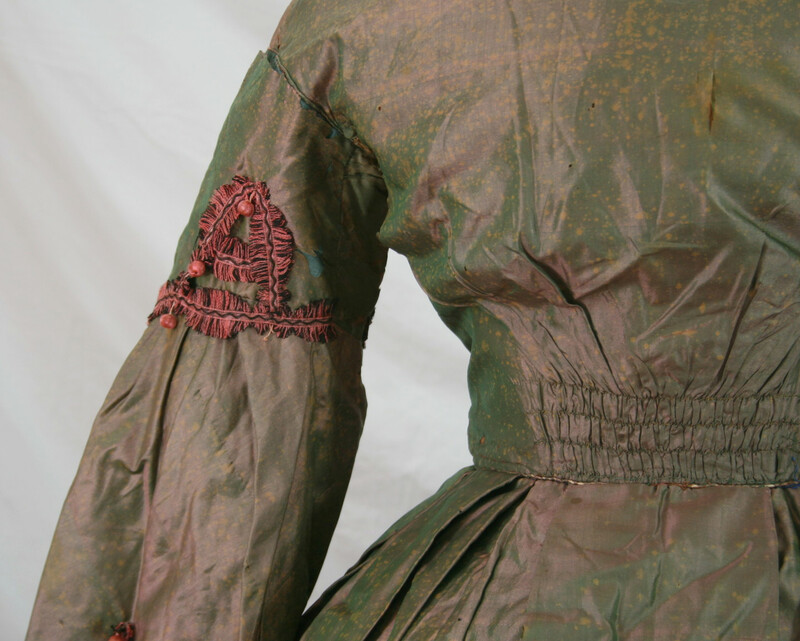 Today’s garment is a silk gown, in a purple and green shot silk, with pink and black fringed trim and pink dangling balls. 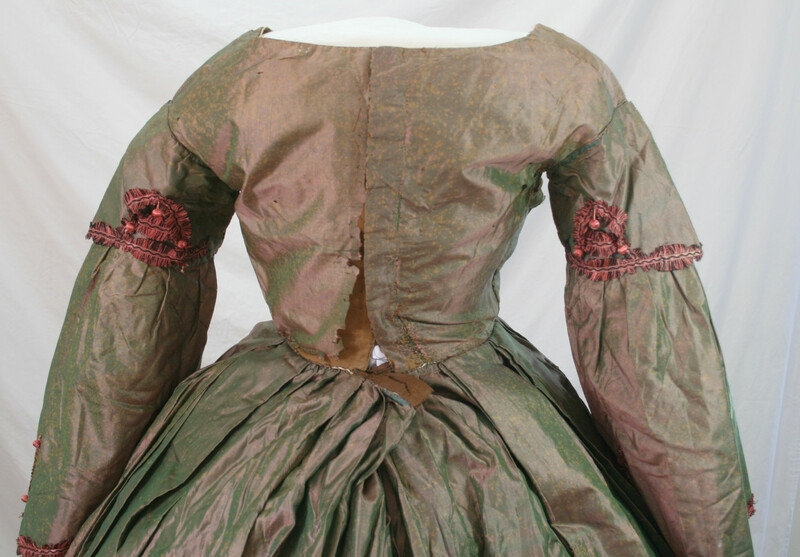 The bodice is gathered to fit with three rows of controlled gathers, and closes in the back. It has open pagoda sleeves with sleeve caps, as well as it’s original fine cotton undersleeves. The neckline is low and open; I’m sorry my form doesn’t have a neck to show it off better. The skirt is box pleated for the waist treatment. Close up of the trims. Many of the little round balls are missing, there would have been 6 on each “A-shaped” trim on the sleeve cap. The back. Fairly badly damaged. Closes with hooks and eyes. 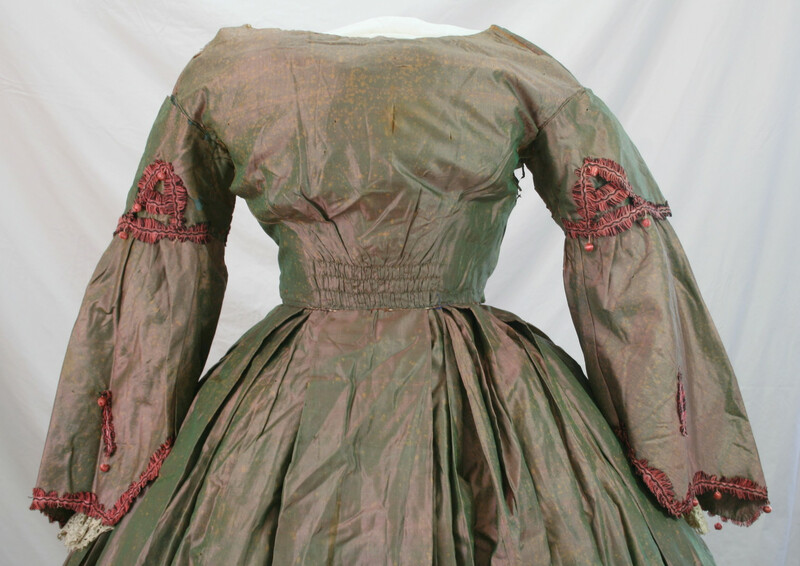 The front lining is fitted with four boned darts. 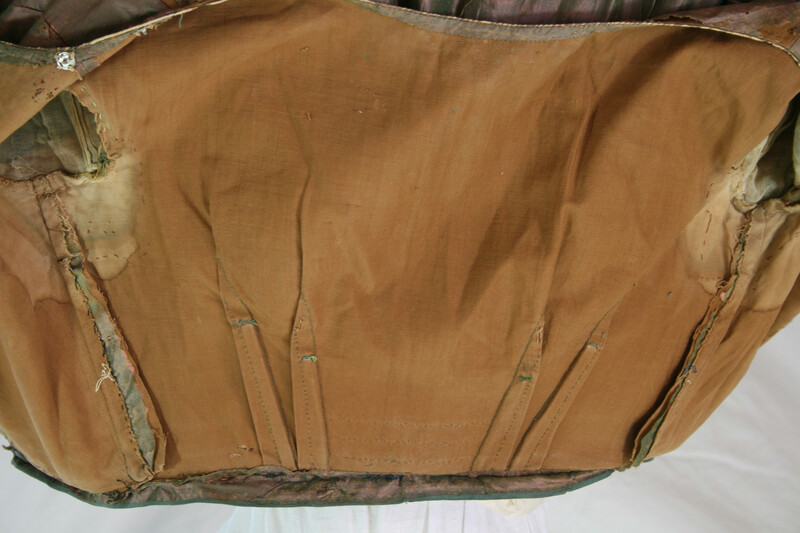 The eye-side of the back opening also includes a short bone. 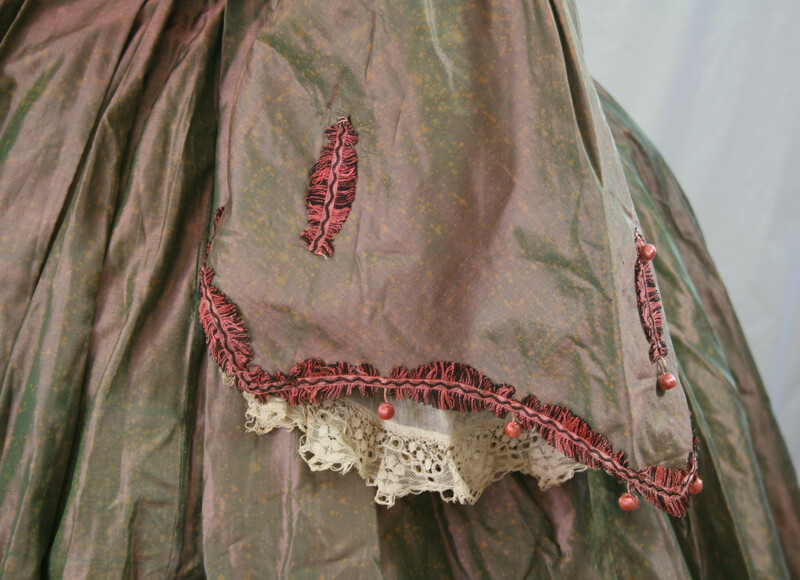 It is lined in brown plain cotton and machine sewn with hand-sewn finishes. 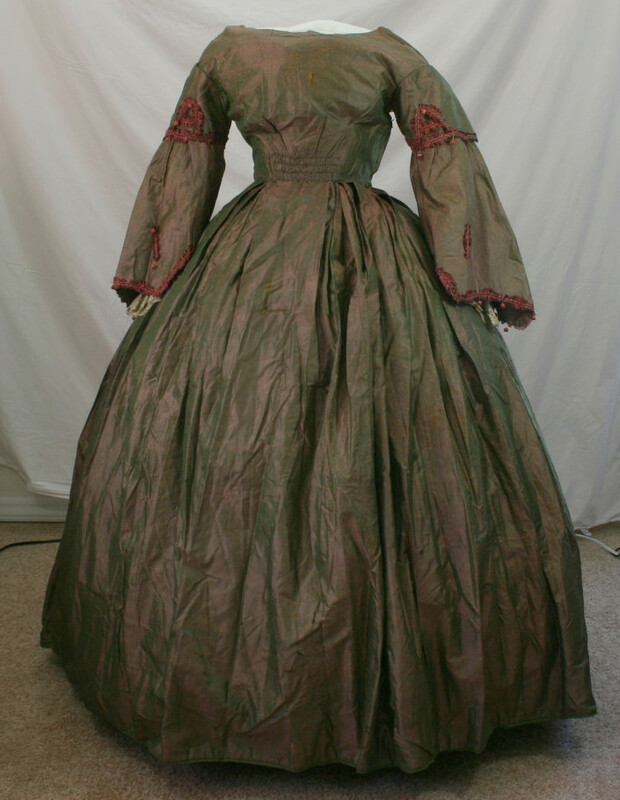 The waist is 22″, and the skirt waist is sewn to a band of scrap fabric that is whipped to the bodice edge. 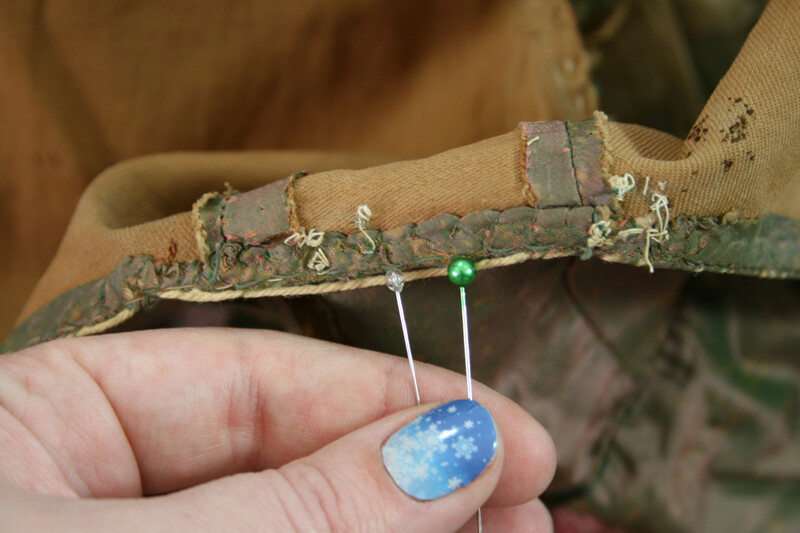 The scrap fabric band has a layer of both fashion fabric and lining fabric. 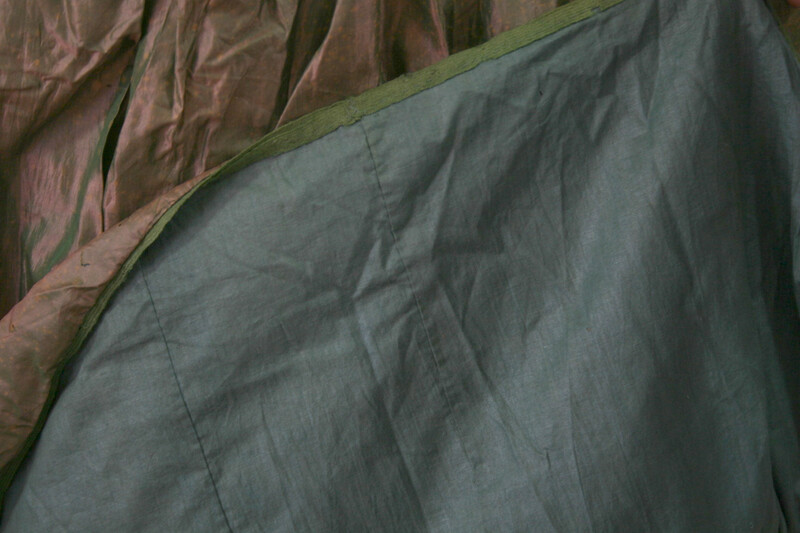 The skirt is fully lined in blue-green cotton, and the hem is finished with green wool hem tape. 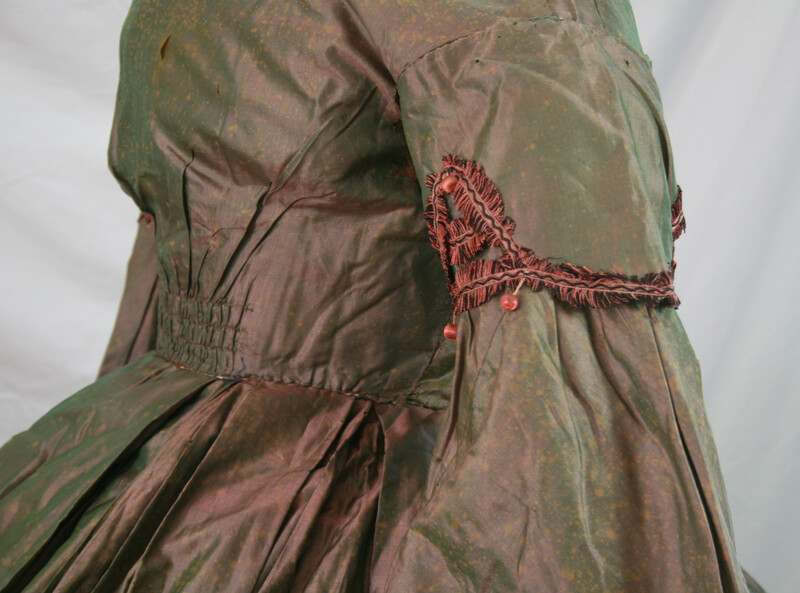 This is my personal favorite hem-tape finish for the mid-19th century (stitch to both layers on the front, flip to back, whip-stitch to lining and encasing the raw edges- this leaves a little hang down of hem tape at the bottom of the skirt). 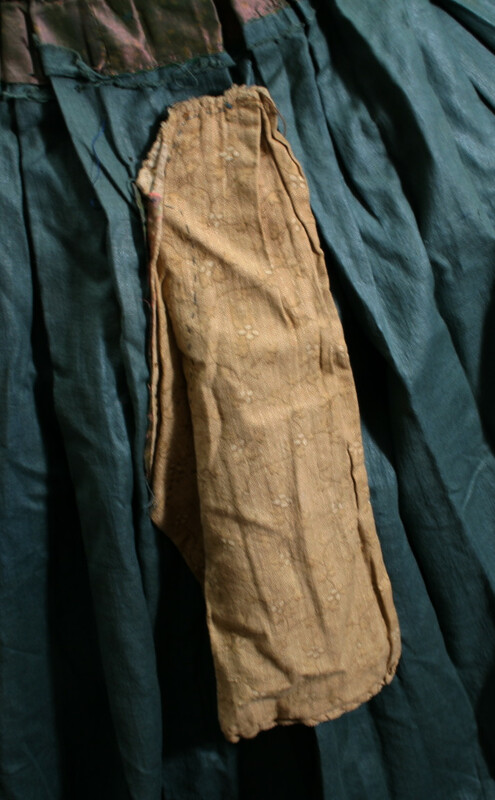 12″ long scrap calico pocket set in one of the seams. Bonus! All the scraps leftover from the person who made this dress were crammed into the pocket. I apologize for the blurriness of the picture, I found the pocket when I was putting the garment away, and thus, lacking good light. Another construction photo, which I plan to use in an upcoming article. One of my absolute pet-peeves among people making reproductions is the selection of too-wide of cording for their piping. Here, the piping cord on the neck edge is exposed. I have a glass-headed pin, and a regular, plastic-headed pin next to it. Piping is small folks, a little bit smaller than even the glass headed pin! If you are using crochet cotton, it is massively too thick. 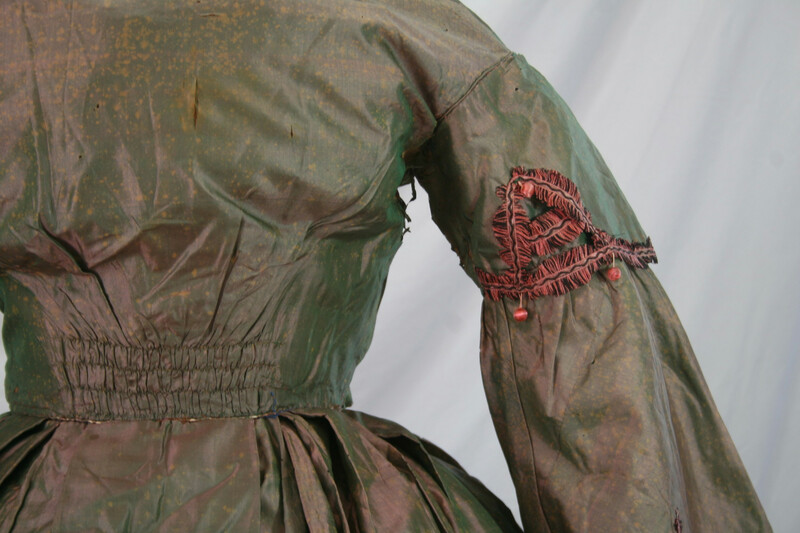 More details of the sleeve trim. And of the sleeve shape, as well as the undersleeve peeking out!